This year I received the sweetest gift from my sister & brother-in-law. They adopted the most beautiful baby last year and my husband and I are the official godparents of this beautiful little girl. 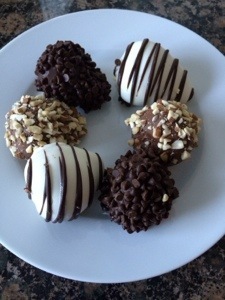 On her behalf, I was sent a dozen chocolate covered strawberries from Shari’s Berries for Mother’s Day. It was a wonderful sentiment and a surprise that I truly didn’t expect but appreciated so much. I’ve ordered these for other people but have never had the pleasure of receiving them myself. Now that I’ve been on the receiving end, I can tell you that they are a fantastic gift to give others. The berries are PERFECTLY sweet and juicy, not to mention beautiful. 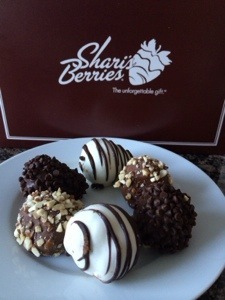 Shari’s Berries offers chocolate covered strawberries decorated for every occasion and holiday, as well as chocolate dipped cherries, cheesecakes, pretzels and cookies. They offer lots of delivery options, including overnight delivery if you need something last minute because your calendar app didn’t work.